Maroon 5’s remarkable 14-year career has established them as one of pop music’s most enduring and celebrated groups. 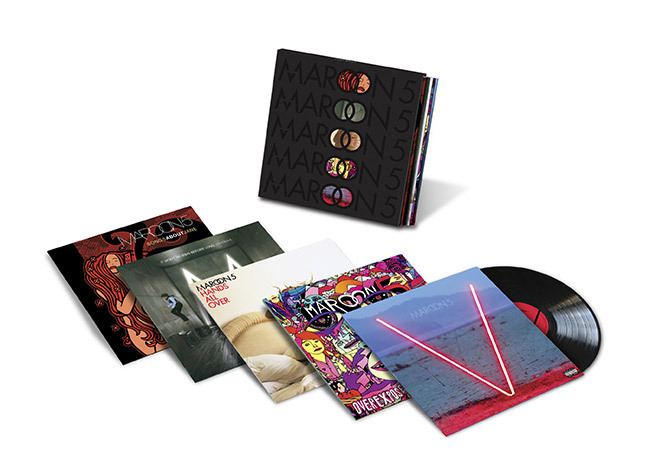 For the first time since their original release, all five of the band’s albums will be released on 180-gram vinyl in a limited edition box set, Maroon 5: The Studio Albums, and as individual titles on vinyl, September 30th — just as the band wraps up its year-long Maroon 5 World Tour of 37 cities in October. All LPs will include original cover artwork. Followed by 2007’s It Won’t Be Soon Before Long (No. 1), 2010’s Hands All Over (No. 2), 2012’s Overexposed (No. 2) and 2014’s V (No. 1), its first for 222/Interscope, Maroon 5 has amassed more than 17 million album sales and 70 million singles worldwide, going gold or platinum in over 35 countries, scoring such No. 1 Top-40 hits like “Makes Me Wonder,” “Moves Like Jagger” and “One More Night,” as well as Top-5 smashes “This Love,” “She Will Be Loved,” “Payphone” (with Wiz Khalifa), “Animals” and “Sugar” with more than one billion views. It Won’t Be Soon Before Long was released on A&M/Octone on May 16, 2007, debuting at No. 1 on the Billboard 200 (and in the U.K.), with Matt Flynn replacing drummer Ryan Dusick, who still received credit on the album as Musical Director. The album’s musical direction veered into a pop-punk-soul area, drawing inspiration from the likes of Talking Heads, Michael Jackson and Prince. The album’s first single, “Makes Me Wonder,” turned into the band’s first-ever Billboard Hot 100 chart-topper, going to No. 2 in the U.K., while “Wake Up Call” hit the Top 20. The album went on to sell 5 million copies worldwide, hitting No. 1 on Billboard’s Digital Albums chart, No. 3 on the Top Alternative Albums tally, No. 3 on Top Catalog Albums and No. 1 on the Top Tastemaker Albums. Hands All Over was first released on A&M/Octone Records on August 18, 2010, then re-released a year later to include their chart-topping, GRAMMY-nominated hits “Moves Like Jagger” and “Misery.” Produced by Mutt Lange, with Benny Blanco and Shellback producing “Moves Like Jagger,” the album debuted at No. 2 and was certified platinum. “Moves Like Jagger,” which was first performed live on The Voice by fellow judges Adam Levine and Christina Aguilera, turned into one of the band’s most successful single releases, nominated for a GRAMMY in the Best Pop Duo/Group Performance category (as was “Misery”). The single is one of the eight best-selling digital downloads of all time, with sales of more than 8.5 million copies worldwide in 2011 and another 7 million since then. Overexposed was released on June 20, 2012, on A&M/Octone Records, and is the band’s only album not to feature multi-instrumentalist Jesse Carmichael, who left the band and returned two years later. PJ Morton, who had been touring with the band as the keyboardist and background vocalist, joined the group. Working with a new set of producers, including hitmeister Max Martin and Ryan Tedder – as well as mainstays Shellback and Benny Blanco – Maroon 5’s fourth album debuted at No. 2 on the Billboard 200. The album has since sold nearly 1.5 million copies in the U.S., spurred by the lead single, “Payphone,” featuring Wiz Khalifa, which went to No. 2 on the Billboard Hot 100, and “One More Night,” which peaked at No. 1. Both subsequent singles, “Daylight” (No. 7) and “Love Somebody” (No. 10) also scored high on the charts.